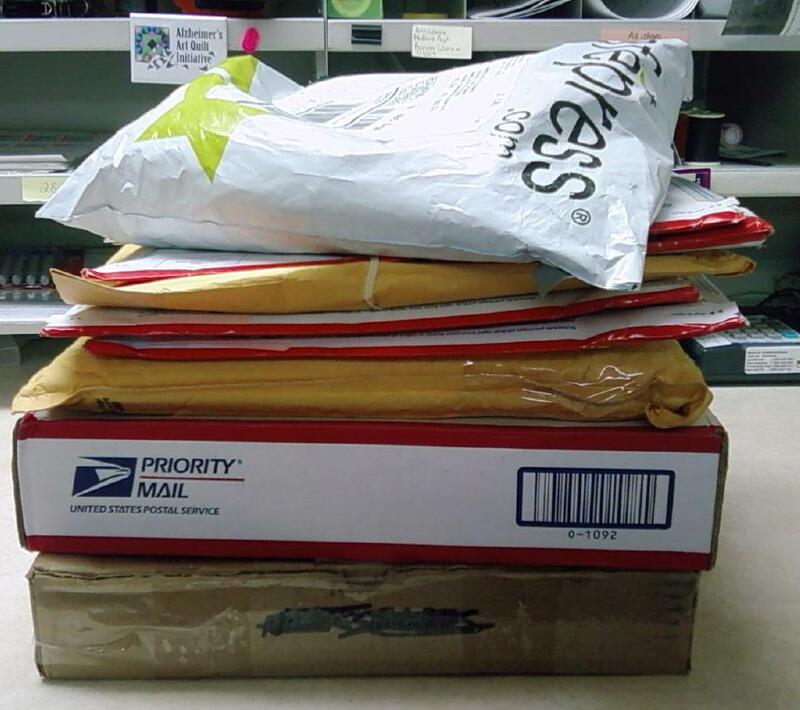 All these packages, except the one on top, are from quilters. I can tell just by looking at them. They came in yesterday’s mail and they’re all Priority: Alzheimer’s Quilts for International Quilt Festival in Houston, Texas, October 29-November 2. The Alzheimer’s Art Quilt Initiative has been given a TRIPLE booth (#5726-5728-5730) by show organizer Karey Bresenhan. We’re right behind the Silver Star Salute quilts in aisle “R.” Brooke and John Flynn are hosting our appearance with a monetary gift to help defray the cost of the booth. My goal has been to bring 1,000 quilts to Houston! (And of course sell them all!) Have you registered YOUR quilt yet? Quilting luminaries including Sue Nickels, Pat Holly, Susan Cleveland, Jackie Robinson, Hollis Chatelain, Karen Kay Buckley, Robbi Eklow, Jenny Raymond, and Darlene Christopherson will be on hand throughout the show to bring quilts off the wall and into your hands. Prices for all budgets. That package on the top of the mail pile? Those are the T-shirts I ordered from CafePress.com. Two have images of very special quilts on them, and one has the AAQI logo. I’m going to wear them in Houston. If you’re coming to Quilt Festival please do the same. And yes, if I see you with an AAQI shirt on, watch out, because I’m gonna hug the stuffin’ out of you! Can’t make to Houston but want to help by purchasing a quilt? You’ve got until 10pm EST on the 10th to bid on an auction quilt, but you can buy a post card sized quilt right now. Entry filed under: AAQI News, Quilting, Quilting News. Bowling Workshop A Screaming Success	Dog’s Eye View: Mushrooms! It is SO exciting to see so many participating! The two I sent this week were numbered over 3,000… and my first one was way back at 53. SO exciting… thanks for being our AWESOME leader, Ami!! !